Thinking about staying in your RV for an extended amount of time? We want to try for a whole year. After 2 months of living in our RV, here are a few suggestions for things you might need. I know living by a stream seems like the easy life, but there will be trying times. Parking, dumping, leveling the RV can be frustrating. Things break, leak, don’t work out the way you plan, your phone & internet may be non existent…..but if you you have a sense of adventure & moderate patience, you can weather all the little things that might ruin your good time. BACKPACK – When it’s time to head up to the mountain or down to the beach, having a sturdy backpack with multiple pockets will come in handy. WATER BOTTLE – You are gonna get thirsty walking around all day or sitting in the sun. I have a Camelbak water bottle I really love, but it became very moldy & it often leaks. I suggest a bottle with a tight fitting lid. Please suggest your favorite water bottle. THERMACELL / OFF – There is a great new invention called a Thermacell Portable Mosquito Repeller. You can lay it on the ground to fend off unwanted bugs or some clip to your belt. There is also a lantern. If you don’t have time to get one of these, don’t forget your OFF. CAMERA – You want to remember these exciting times. Unless you have a really amazing cell phone camera, I suggest a point & shoot camera or a DLSR w/ different lenses. BEAR SPRAY – If you will be in bear country, it’s a good idea to bring some bear spray. WATERPROOF BOX – Rafting down the river, getting rained on in the mountains, sunning at the beach…a waterproof box will save all your electronics from water& sand. 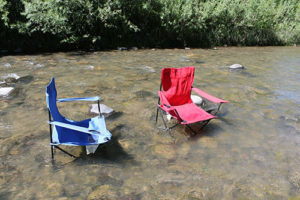 CAMPING CHAIRS – There are often picnic tables at RV sites, but a good camping chair will come in handy. WALKIE TALKIES – Your phone might not work in some locations. Long range walkie talkies will be useful in the wild & they also come in handy when backing up, parking or leveling the RV. BINOCULARS – It’s always fun to look at a beautiful landscape with binoculars so you can soak in all the small details or zoom in on the wildlife. SUNSCREEN – Spray, stick, rub on…whatever does the trick for you. Get a high SPF. FLASHLIGHT & LANTERN – Even thought your RV might have outdoor lights, a flashlight and/or lantern will always come in handy. I really love my Etekcity Ultra Bright Portable LED Camping Lantern. It’s provides mellow light for inside the RV or sitting outside at night. 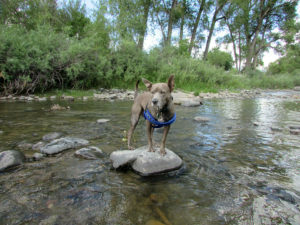 EXTRA FOOD & TREATS – You can’t always be sure your pet’s food or treats will be available in your adventure area. Bring extra. Consider storing it all in a plastic container. Don’t forget their food & water bowl. MEDICATION – Don’t forget the flea treatment, heartworm meds, etc. BED OR BLANKET – If you plan to sit outside a lot, bring your pet’s bed & maybe a blanket to keep them warm or keep off bugs. POO BAGS – Lot’s of RV & camping sites ask you to scoop the poop. While some places offer free bags, it doesn’t hurt to bring some extra. COAT – If your pet has short hair or your will be taking them to a climate significantly cooler, get a coat. LONG LEASH – Even if your pet is good without a lease, campgrounds are full of wild animals & other pets. Best to keep your pet near & give them a little extra room to roam. 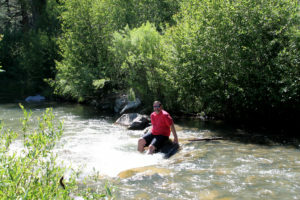 WATER SHOES – Don’t get caught by the creek, waterpark or beach without a good fitting pair of water shoes. GOOD WALKING SHOES – Hiking, sightseeing, shopping, exploring…I suggest a good pair of tennis shoes, but you know what works for you. 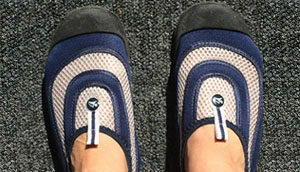 SHOWER SHOES – A pair of flip flops work well if you use the communal shower. You can use your water shoes as well. RAINCOAT & COAT – You might get wet, it could get cold. My raincoat & coat can both be stuffed into little bags. LAYERS – It’s always hard to know what the weather will be like in a new destination. Best to start with a tank top or tshirt followed by a long sleeve shirt & a windbreaker. Humid climates you should wear breathable items so air can circulate through your clothes & you don’t end up a soggy mess. Dry climates it’s good to seal up your openings with tighter fitting clothes. HAT – Ball cap, sunhat, Indiana Jones adventure hat…staying in an RV means spending lots of time outside. Spare yourself a bad sunburn or tame your wild adventure hair. 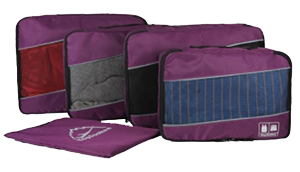 PACKING CUBES – Really want to organize your wardrobe, buy some packing cubes. You can easily store these cubes in a cabinet or closet. They also fit well in your suitcase or backpack. CHARGERS – Make sure you have the charger for your phone, computer, toothbrush, camera, tablet…I like to put all my chargers in a large bag with a zipper. SHOWER CADDY – Attmu Mesh Shower Caddy is perfect for your travel size shower items. Dries quickly. ROLL OF QUARTERS & LAUNDRY SUPPLIES – Lots of campgrounds have laundry rooms. Bring your detergent, a laundry bag or basket, dryer sheets & quarters. EAR PLUGS/SLEEP MASK – Loud neighbors won’t bother you with some ear plugs & a sleep mask will block out the early morning sun or let you enjoy an afternoon nap. TRASH BAGS – Bring a trash can & don’t forget the trash bags. Clean up that mess! EXTRA BATTERIES – Buy some batteries & then buy some more. MICROFIBER TOWEL – Bath or kitchen microfiber towels dry quickly which keeps them from molding. You might need some regular bath towels, washrags or hand towels. MATCHES OR A LIGHTER – Campfire, candle, lantern, grill…you’ll probably need some fire. MESH BAGS – Always good to bring extra bags. A mesh bag will make it easy to see what is in the bag & it will dry quickly. SCISSORS & SEWING SUPPLIES – There will be lots of uses for scissors and a small sewing kit might save the day. Many of the items talked about on this page are listed for sale through our SUGGESTED PRODUCTS page. Let us know how your trip goes & Feel free to send your own suggestions for things I may have forgotten.